Easter is already approaching! We can feel it in the air…so why not surprise your guests with a special and savoury typical Italian easter recipe? Try to bake the Torta Pasqualina your own! 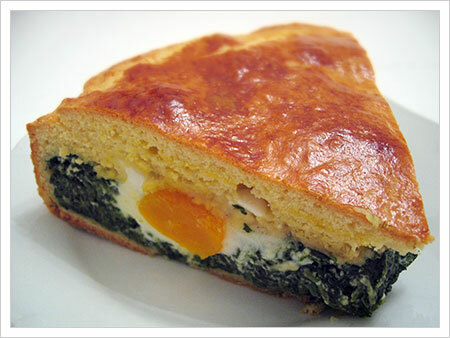 The Torta Pasqualina finds its origins in Liguria, a region in northeastern Italy. It is mostly made of a green mixture; the most common is swiss chard but you can also use spinaches or arugula. In Liguria they add to the mixture a slightly sour fresh cheese called prescinsena in place of the ricotta. Originally, the Torta was made with layers of filling alternated with paper-thin sheets of pastry: 33 layers of dough were used representing each year of Christ’s life. Also, 12 eggs were added to represent the apostoles. The one we propose here is an easier one, made with 2 layers of douogh forming a top and a bottom crust. Good luck in the kitchen! Combine the flour and salt in a large bowl. Stir in the oil and 1/2 cup water to make a smooth, non-sticky dough. Knead just to bring the dough together. Divide the dough into 2 pieces, one three times the size of the other. Wrap each piece with plastic wrap. Allow the dough to rest for 30 minutes at room temperature. Combine the Swiss chard and 1/2 cup water in a large pot. Cover and cook over medium heat until tender and wilted, about 10 minutes. Add the spinach and season with salt. Cook 5 more minutes or until spinach is wilted. Drain the greens and allow to cool. Squeeze out as much water as possible from the greens. Place on a cutting board and finely chop. In a small saucepan, melt the butter. Add the onions and cloves. Cover and cook over medium heat until the onions are tender, about 5 minutes. Remove from the heat. In a large bowl, beat 2 eggs until blended. Add the greens, onions, ricotta, 1/2 cup Parmesan, marjoram, nutmeg, salt and pepper. Mix well and set aside. Preheat oven to 375 degrees F. Oil a 9-inch springform pan. On a floured surface, roll out the larger piece of dough to a 15-inch circle. Place the dough into the pan, pressing it against the bottom and up the sides. The ends will overhang the edge of the pan. Add the filling to the pan and smooth the top. Make four evenly spaced indentations in the filling. Carefully break on egg into one of the indentations. Repeat with the remaining 3 eggs. Sprinkle each egg with some of the remaining tablespoon of Parmesan. Roll out the smaller piece of dough. Cut out a 9-inch circle, using the bottom of the pan as a guide, if desired. Place the dough circle on top of the filling. Trim the overhanging dough to 1-inch. Fold the dough inside the pan over the edge of the dough circle. With your fingers, crimp the rolled edge to seal. Brush the top of the dough with olive oil. Make several small slits in the top crust. Bake for 45 minutes, or until browned. The top with puff up during baking but will relax when cooled. Cool on a wire rack about 10 minutes before removing the side of the pan. Serve hot or at room temperature. Wanna learn more typical Italian dishes? Try our Italian cooking courses at Institute Galilei held by professional chefs!